We receive email several times a week from fellow RVers who would like us to help plot a route for them. As we have said many times, the next best thing to RVing is talking about it and we do love to help when we can. To properly plan a trip there are a number of questions that need to be answered for anyone to be of help including your type of RV, how many days do you have, fastest route or scenic route, overnight stops - type of campground - local, commercial, State or freebie and amenities/hook-ups required, how many miles/hours you like to travel in a day, etc. For us to help you we'll start with a list of things Niki and I take into consideration in planning a new "adventure" into unknown territory. We would ask you to try these first and then we will be happy to try and answer any specific questions you might have. 2. Determine overnight stops by how far (miles/hours) you want to drive in a day - Distance Between Cities. 3. Find the campgrounds, RV Parks or places you'd like or need to spend the night on the Allstays Website. 4. Check the Campground Reviews on the campgrounds that interest you. The answers to the questions are important. The type of RV dictates what roads to take with low bridges, tunnels and bridge restrictions in mind. The days you have available dictate how far you need to travel in a day or it might say you should rethink the overall plan and shorten a trip for comfort and safety. If you feel comfortable driving 300 miles in a travel day then that town or city on the route is the area to search for an overnight stop. Do you want a full hook-up (FHU) stopover or just a safe, free place to grab a few hours sleep? Many variables and personal requirements to consider. If you would permit us a short story that changed how we travel. It was our very first RV trip from Upstate NY to Florida and it was all about the destination. We covered the 1,400+ mile trip in three days to get to the Sunshine State. Result - it took us a week to rest up and to decide we didn't really want to sell the RV and give up RVing altogether! We now travel a maximum 250 miles on travel days and spend at least two nights in each stopover to explore an area. We decided to make our adventures all about making the trip fun and not just the destination. We have added other references below that we have found useful in our travels. We definitely recommend you obtain a Roadside Assistance plan to put your mind at ease in your travels into the unknown. We also recommend you purchase a Rand McNally Trucker's Atlas to carry on the road. All roads in all States are highlighted that are safe for truckers and there is also a section listing low overpasses by State and route. If the route is good for a trucker it will be good for any RV! For a list of all the maps, reviews, routes and articles on our website please visit our Quik-Click Index page. Below is a listing of all the main websites we have used when planning our next road trip. Allstays.com - the one-stop resource! When we started RVing I did a lot of research to find the best information and the best websites to help us learn about this new lifestyle. It was all totally new to us. Allstays provides a free version but once you use it you'll find it gets even better in the new pro version as we did and you'll probably decide to move on up. After finding Google Maps to help us plot a route we needed to find out what it was like between Points A and B. The website we found most helpful in that regard for our past 8 years has been Allstays. With the "Map Filters" you can select just what you are looking for and find it when and where you need it! Not a huge corporation, Allstays was started and is maintained by Adam Longfellow. Adam is an RVer and he was unhappy with the info available for himself and is constantly adding and updating to this day for the benefit of all of us. We try different routes as we travel. We want to see what we can find on either side of the Interstates that we missed rushing to a destination back in our working days. On the East Coast we run I-26, 65, 69, 70, 75, 76, 77, 81, 84, 87, 88, 90, and 95 regularly to name a few. Some people like to use the Interstates, some don't. They are the principal routes in the U.S. and it's a trade-off. We put up with the traffic and don't have to worry about low overpasses, 5-ton limits or traffic backed up behind us on two lane country roads. They are also a quick way to add new States to our "Been There - Stayed There" USA map. As we try new routes we also try new campgrounds and change our route maps to reflect and include the best we find as well as our other new discoveries in dining and sight-seeing. What happens when you are far from home - in a new area - and you need an RV Repair Technician? If you have Roadside Assistance that can be a good place to start - but there is also a website where you can find reviews of local RV repairmen by State RV Service Reviews. guide that's listed free on the Internet. Participating Good Sam Parks offer 10% discount to members but you now need to be a member to use their route planning service. 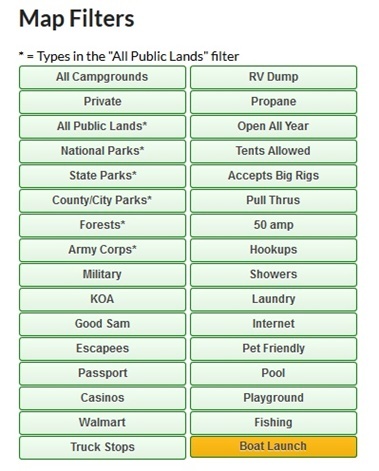 Over 20,000 Federal, State, and County campgrounds by State. Concerned about the weight of your rig? Find out how easy it is to determine and put your mind at ease with CAT's help. They offer a free video. Sometimes you need a quick and safe place to stay overnight but not all Walmart's allow RV's to spend the night in their parking lots. Gas Buddy gives prices submitted by consumers and usually only a couple of hours old. They actually want RVers to stop by. They offer special lanes for us and discounts using their member card. Nothing fancy but very helpful to those on a budget. Choose your destination from a drop down menu to check prices and buy your fishing or hunting license. have been an indispensible help to us from day one. Our RV Bible is the "Rand McNally Motor Carriers' Road Atlas". to be avoided. If an 18-wheeler can navigate it - so can we and you! money. It's a reference you will refer to again and again. you will need to make an unscheduled or emergency stop. about on any new route we plan to take. We have researched most of the campground clubs and most are fine and offer very similar services if you want to travel the same routes and stay in the same member campgrounds as you travel. We don't. Our goal is to travel America in our RV and see and do what we have only read about, not having the time or perhaps the money to do in our previous working life. Roadside Assistance is a must if you spend a lot of time on the road. Sooner or later something will require fixin' and it usually doesn't happen when you're sitting in a campground or a dealer;s parking lot. We have tried Coach Net and they are fine but only cover the tow vehicle when it is attached. We tried Good Sam and actually needed to use them several times and the service was satisfactory but we really take issue with a low introductory price the first year followed the next year by nearly doubling the price at renewal time. We dropped them and now use AAA Roadside Assistance. The price is decent, the coverage good, and they offer a host of extra free services like trip planning, travel books, and campground guides. We do use Good Sam Mail Forwarding service out of Pensacola. It is economical and they are responsive to our needs and instructions. We did subscribe to Good Sam Travel Assist for one year but did not renew. Read the actual Good Sam coverage carefully. If you are traveling extensively then a Rewards Card from Good Sam will save you 3 cents/gal at the Pilot/Flying J Truck Stops. Pilot/Flying J actually wants and appreciates the RV business they receive. Good people!